Scientists from TU Berlin develop an improved malting method using ultrasonication of barley in order to improve the malt quality. Thereby sonor waves within the range of 50 to 500 Hz are applied to a mixture comprising water and raw fruit using mechanically vibrating device like e.g. a shaker. According to the invention the mixture is set to vibration mechanically during at least the at least one time period of the steeping. With this method it was already possible to enhance the cleaning effect on brewing barley by up to 37%, when repeating the method by up to 50%. 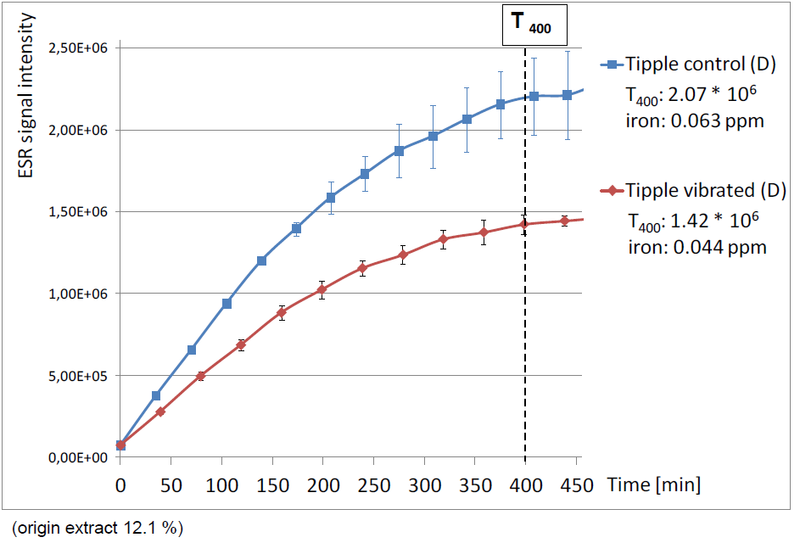 Using the method it was shown as well that total iron entry into steeping water was reduced by 15% and that the total water uptake in the sonicated barley was 2% higher than in untreated barley. Moreover, due to the reduced iron content in the resulting beverages their oxidative stability (EAP value – see figure 2) could be improved.